The Godling Chronicles: The Shadow of Gods, Book 3Written by: Brian D. AndersonNarrated by: Derek PerkinsI love where this is going, at times, lol. Battles, intrigue, mysteries, Gewey finds out more about himself, some humans and elves come together, and soooo much more! Love the magic, suspense, love, battles, creatures, and epic fantasy....love this so much! The narrator is sooo good, he is consistent in all the books and does so many different voices and creatures! Awesome job! Book Info: Genre: Epic FantasyReading Level: Young AdultRecommended for: fans of epic fantasyTrigger Warnings: a person determined to split up a pair of lovers, murderMy Thoughts: Like the 2nd book in the series, this is much better edited than the first one, but there are still some issues that remain, mostly having to do with the tense. Here are a couple examples to illustrate the problem that was throughout the book: “Selena sat in her chair and motion for Salmitaya to sit across from her.” and “I simply did not want to cause you more grieve so soon after so much tragedy and bloodshed.” These sorts of issues were throughout the entire book. That said, the story is engaging and fast-paced enough that I didn't end up overly distracted by it, instead shrugging it off and moving along to see what would happen next.Aaliyah really upset me. Like many people, the idea of infidelity is anathema to me, and her initial attempts to come between Gewey and Kaylia had me infuriated. She had noble reasons, but still. She reminded me of the character Mata Hari from Scott Rhine's book The Redemption of Mata Hari. One thing I've never understood is villains that want to destroy the world. At one point, someone says that the Dark Knight wants to “see the world burn.” I have never understood why these sort of maniacs want to take over the world just to destroy it—like bringing eternal winter or whatever—because what is the point of putting in all the time, effort, and power to take over the world simply to rule over a barren wasteland? Even villains have to eat, and if they've destroyed everything, on what will they survive? What is the point? Am I the only one who is driven nuts by this question?Well, I'm really rambling on this one. This is my final day on the Godling Chronicles' blog tour—and my final post—so be sure to check all the links below to see what you've missed. This is not the end of the series, but I'm not certain how many books the author ultimately intends to write. Things are kind of drawing to a head here, but I imagine he could string things out for a few more books if he really wanted to. This is the sort of epic fantasy that I tend to really enjoy, so I'll likely be watching for future stories in the Godling Chronicles to see what happens next. 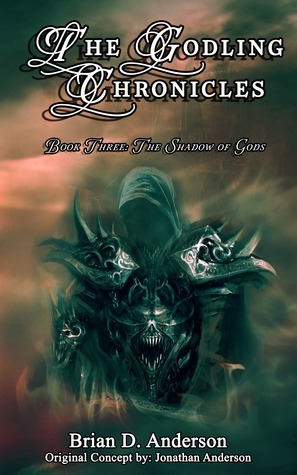 If you enjoy epic fantasy, then you should take a look and see if this might be a good choice for you as well.Series Information: The Shadow of Gods is book three in the Godling Chronicles.Book 1: The Sword of Truth (or on Smashwords here) (review here where formatting allowed)Book 2: Of Gods and Elves (or find it on Amazon here) (review here where formatting allowed)Also, see this author's guest post on my blog, linked here (where formatting allowed).Disclosure: I received a copy of this book from Great Minds Think Aloud Publishing in exchange for an honest review. All opinions are my own.Synopsis: Valshara has fallen, and the forces of Angrääl are advancing. For the first time, human and elf must shed blood as one, in order to stem the tide of evil. But new hope has arisen. across the Western Abyss, a people long forgotten have returned. However, hope comes at its own price. Gewey must choose between his bond of love, and his duty to the world he is struggling to save. Quite engrossing. This series is earning a solid 4 stars across the three books read, so far, despite typos and an occasionally slow pace, when the author describes things that don't matter to the plot, like where someone is sitting at the table. Alliances join hands from across the Great Abyss (ocean) and from Far East. Wonderful and terrible powers grow apace, on both sides of the fight. Gewey the godling gets a new name, Darshan, while seeking powerful ancient weapons in the desert. Meanwhile, the faithful servant Millitt rises nobly to his new station in life, while Lee Starfinder and his son Jacob strive to save Lady Penelope from the enthrallment of Lord Angrääl, the reborn king.Funny scenes between Gewey and the stiff-lipped navigator on the ship. Cute! Action-packed battle scenes in the desert. Political alliances and betrayals amid the 12 kings of the 12 city states. New friendships take root, newly discivered history / prophecy is revealed. The story continues with the sequel, next on my list.Superb narration by Derek Perkins. Gewey Stedding has much to learn about his personal power. Kaylia seeks to help Gewey do this and to complete the bond too. An elf named Aaliyah tells the elves that she and her companions are from the Western Abyss. Aaliyah wishes to help train Gewey for the battles ahead and to become his bonded mate. Kaylia is fiercely upset by this announcement. Gewey says he will not choose Aaliyah over Kaylia. Kaylia agrees that Gewey should be trained. Aaliyah and Gewey leave by ship to reach their destination. Lee and his son Jacob must find a way to rescue his wife from the Reborn King. Reborn King is gathering an army the likes of which haven't been seen since The Great War. Will Gewey choose Aaliyah? How will Gewey's training go? What is The Reborn King planning to do? Your answers await you in The Shadow of Gods.Each book keeps getting better and better. I love the growth in Gewey's character! I love that he's embracing his powers rather than allowing them to rule him. I find the addition of Jacob to be interesting to Lee's overall character with deep regrets, remorse, longing, and love too. I applaud Mr. Anderson on encouraging the creativity in his son. I look forward to the next book. Every now and then the party needs to split up. I thought the party was spread a little thin at one stage. We had Gewey sand surfing the desert surrounded by foes on all sides. Leigh heading into a trap aided only by his broody son Jacob. Maybel is unaware that she's being escorted by an Elf who is on the turn. Kaylia is with a hybrid army of elves and humans readying to storm Valshara. And meanwhile back at the ranch, Larry and Stretch are surrounded by marauding Apache oops sorry Grover wrong book. All this while Gewey seems to be believing his own press and is pumping himself up before yet another possible trip to the healers tent. My advice " this is only book 3 so settle petrel "
this book was very hard to actually get into. The first to books were much better, almost seemed like the author couldnt seem to come up with a good trasistion point for this book. Characters were uninteresting and you could really care less for them and the story line just seemed to be jumpy. Hopefully the next book will be better, since the first books were good. Would still recomend reading this just to be able to read the next one though. just keeps keeps getting better and better! I honestly think this book is up there with Some of the greatest fantasy books of our time. its that well written. Im not going to give any spoilers but I love the part where Gewey rides the "Waters of shajir" or the bood of the dessert. I wish we had that way of traveling even with the risk of the vortex!! Once again Brian D. Anderson. you left me excited for more! Enjoying the series This series is not as complex as Wheel of Time or Game of Thrones but it is engaging and I enjoy the world Anderson has created. Because it is not focusing on as many story lines it is easier for me to pick up for a few chapters and resume later when I have time. The only fault with this book is that you have to wait for the fourth one to be released!The characters are well defined and the world they live in is alive in my imagination. There is enough detail there to get your creative mind fired up without boring you of the details of how they cooked they rabbit stew! (hate books that go into to much detail)I thoroughly recommend this series so far. Hmmm, for the last book of a trilogy this felt like just a warm up to what follows. I must say this is a good series but not great. I feel that the reborn king remains far too distant so far as a brooding and near invisible presence. We shall see where this goes next. Of course including the prologue and first chapter of book four was a every clever move. I cannot put this series down. I cant remember when i ever read a series from start to finish ( or rather book 3) in one go before! Great read...looking forward to Book 4! Another excellent addition to the The Godling Chronicles! This review is more for books one a two to be honest. It was just here that I gave up.I listened to it on audiobook and I will say that I found the narrator to be pretty great. Definitely a great voice for narration and different characters. Saving Gewey himself who the narrator seemed to go out of his way to make sound like a ten year old. He was quite consistent though and I did notice him actually going out of his way to age Gewey's voice as the story progressed. Impressive. And unfortunately, that was probably the best thing about the story.I can't help but feel like, once again, if it had been the first one I'd read, I would've liked it more. The problem lies in the story's utter lack of originality. The story telling is good, the characters are actually pretty engrossing. But the plot. I've read it before. It tries to break the bounds of Tolkien, don't get me wrong. It just... fails. Killing the regular parents before the book starts was a nice touch since we didn't really have to deal with all that drama, but as I try to come up with plot points that I haven't seen in other fantasy stories before, I'm coming up blank. From word one I found myself calling what would happen next hours before the audiobook actually got to that point. Save elf from bandits? Gonna have to be a princess, and 10 bucks the love story develops between them.She runs off into the woods and I'm like "Yep. Gonna see her again in a few words. "She even straight up declares that she's NOT a princess later on, but somehow this only makes her seem MORE of one. First book she's made out to be a bit of a badass, but... she's not. Three or four times Gewey has to save her. It just gets old. Not to mention the unbelievably over done "MY PARENTS WHO ARE MY PARENTS?" tripe(As seen in HP, Eragon, Sword of Truth, Wheel of Time, etc). On the plus side, it subverts this by really having Gewey not all that curious about who they are, but subverting doesn't make it not there. But, once again, the main character is the son of someone IMPORTANT, which therefore makes him IMPORTANT. Farmer taken by a wise older mentor figure on a quest to save the world? (As seen in... Please. I could go on all day. )There's something else that has annoyed me to no END about this story. Any time someone argues, the other person agrees. Instantly, and painlessly. "No Gewey. Don't do that." "Okay." "No Lionel. You can't come with me with the random foriegn wizardess elf. You must stay and help your people because reasons." "Okay." "No Gewey. Don't chase after your wife-to-be. Let us gather information for one hour!" "Okaaay!" "No Gewey! Don't torture that elf that just attacked us! Let us do that!" (You guessed it.) "OOOOOOKAAAAAYYY!" The simple act of argument makes ANYONE in this story cave. From Gewey to Kaylia to Maybell to Deana to Gewey to Starfinder to Gewey... to Gewey. Okay its mostly Gewey. But seriously. In this universe, all you have to do it seems like is argue for half a second. The other person caves every time no matter how flimsy your logic. It takes no effort to convince anyone to do anything, and no one EVER just does something anyway. The second someone argues to instead do "THIS" whatever the argument is, its gonna go that way. The viacore? Viacol? (Myrdraal, Dementors) They're Ringwraiths and poorly disguised ones at that. They even had poisoned blades which I found so annoyingly cliche that I wanted to skip the whole section.Going a bit further into my thoughts on the characters. I found them to be hollow. Gewey is a Mary Sue, but honestly that's to be expected. He's quite often referred to as a literal god. Okay. I can buy that. But Lee (Aragorn? Lan? Obi Wan?) is the quintessential man at arms, wrapped together with the wise mentor (Gandalf? Moiraine? Obi Wan?) all in one neat package. He was actually a fun character BEFORE he was a character though, and to be honest? I think I'd read about the boy who hated the temple and went off to be a lord's servant, only to later be told by an Oracle that he would be charged with giving up everything to save the world. Damn that would be fun. Unfortunately that awesome backstory is told to us in a chapter and expanded in little bits to make Lee into what he is. A relatively cardboard good guy.Worst of all is that, we're at book three and there isn't any proof so far that the Reborn King is actually anything more than your average king. Apparently he's affecting the weather. Apparently he makes Nazgul. He IS raising an army but that's what kings DO isn't it? There is no proof that he's evil and oh my god if only that were the case. What a mindfuck THAT would be right?But this book has followed all the cliche's so far and to be honest, I don't expect it to break the mold in any way shape or form. Of COURSE Gewey isn't going to fall for the foreign elf with old magic. Of course the Reborn King is evil. And this summary for book six: "But will his power be enough to free the world from certain annihilation? Will he be strong enough to save the people he loves?" Yes. Oh my god, duh. Yes.I'm probably going to drop this book. At a certain point, I found continuing to read it to be a chore rather than a delight. The new elf from across the waste plot in book 3 cinched it for me. Gewey and Kaylia's tenuous love (that makes very little plausible sense anyway) is affirmed. Got to immediately test it by giving the young farmboy a trip alone into the East with an unknown elf woman to train. This particular thought is not a critic, but pure opinion, as I admit much of this review has been.I felt passionate about this story. It drew me in and I did like the characters, Deana in particular, but I feel like I've simply read the same story too many times. Perhaps I'm jaded, but this feels like a carbon copy of Shanara, Sword of Truth, Eragon, and a slew of other fantasy stories that already told the same story. So two out of five stars. The unoriginal plot is buoyed considerably by mostly relatable characters, good writing, solid pacing, and a great narration if you prefer the audiobook. Final note? Lee Starfinder. Starfinder starfinder starfinder. I swear the characters LOVE saying that guys name. I don't think I've ever seen more pointless last name drops. This is mostly just amusing though. If my name were that badass I think I'd drop it more often too. Fantastic Read! I was first introduced to the author, Brian Anderson, when I thought, mistakenly, that he was the author who was chosen to complete the Wheel Of Time series by Robert Jordan: an author that I adored and avidly waited for the next book from with bated breath. It wasn't "him"! Wrong author! But what a happy accident when I downloaded this author instead! I downloaded the first book in this series "to try". I was lost. I couldn't read each offering fast enough and was constantly worried that I would eventually come to...the "last" book in the series. Eventually, inevitably, I did reach the end, but oh what an adventure. I ended up reading his Dragonvein series "and" the Godling Chronicles series too!This Series will definitely deliver for you that oh so elusive reading nirvana! This book is perfect for young adults to adults. Great bookThis is a great story that keeps you hooked. I cannot wait to start book 4.I would recommend this book and series. This series is getting better and better with each leg of the journey! The Godling chronicles is now starting to come into a state where the story goes from being gentle and introductory to riveting and action packed. A lot more happens in this instalment of the book that the first two books. The lead characters, having taken their respective places in the plot in the previous books are now starting to play their parts. The nature of relationships that these characters share with each other have also started developing layers (albeit not too complex).Not only the characters but the different factions within the tale are starting to solidify their positions in context of the larger tale. This series continues to be difficult to rate or evaluate in piecemeal as the narrative is a single continuum. And hence, new characters are popping every once in a while who will clearly have a bearing on the climax. The state of the story of Gewey and Kaylia at the end of this book is very similar to a game of chess where the opponents have both made their initial set of moves and are now poised to make play to take control of the board.I am going with a 4 out of 5 for this book as it has me on tenterhooks with the promise of intrigue and action. So here is my issue with this book, the action really lacked towards the middle and end. It just got a little too boring and predictable. I know Lord of the Rings really got this genre started and all but it doesn't need to sound like it as well. Don't get me wrong, I love a good fantasy adventure end of world type book but seriously, step away from the clichés. I'll definitely read the fourth book but at this point, I have a feeling it's going to end with the good guys winning and the world is saved from darkness.Oh and narrator made a 15-17 year old sound like he's 9. I'm pretty sure by then his balls have dropped. Give him a masculine voice for goodness sake. Even if squeaks at times, it would sound a lot better than how he's protrayed at the moment. The story expanded to an adventure in the desert and the discovery of two branches of the elves that were unknown. I liked the expanded world a lot. But Gewey, the main character, continues to be disappointing. He's vanilla and reactive and for all purposes is just a human with some elf powers--weak and driven by everyone else. And then the ending was literally a meeting with a decision to start preparing. So weak. I won't be reading any more books in the series. This was one of the best ones so far our main character is learning his abilities and new character are being introduced. The dark knight is also moving forward is making his move to destroy and rebuild the world. This the part of the series that I almost don't want to continue because I'm afraid some of my favorite people will die, but I will drive myself crazy if I don't. We must go on. This got pretty slow in the middle - forcing me to put it down for quite some time. I'm glad that I picked it bak up. The action finally starts to move. The beginning of the book contained lots of training and treaties. The final thirds gets things moving and I'm looking forward to the next scene of the saga. Not sure why I keep on reading this series. The editing is poor (lots of typos and grammatical errors), and the story is pretty derivative of many other better fantasy series. But now 3 (out of 6) books in, I'm curious about how the story will end. And these books are quick reads. I suppose I'll keep at it unless something happens that really turns me off them. It keeps getting better. The longer this series goes, the more invested you become. You really start to love the main character, and even more, his love. The characters are interesting, the plot thick, and darkness is around every corner. I am excited to see how the rest of this series turns out. The gosling chronicles: the shadow of gods (book 3)Well written, filled with suspense an amazing story with wonderful characters and an excellent plot. One of the best series I have read in years! Brian D. Anderson Jonathan Anderson - Brian D. Anderson was born in 1971, and grew up in the small town of Spanish Fort, AL He attended Fairhope High, then later Springhill College where his love for fantasy grew into a lifelong obsession. His hobbies include chess, history, and spending time with his son.